Stone Cold Terror: Winter Horror Films that give you a Chill! So here I am in Rhode Island going through our first blizzard of the winter. The storm, which dumped 15+ inches of snow and sleet, could have been a lot worse. In addition to having 50+ mile an hour winds, it is also bitterly cold. Flights are cancelled and workplaces are shut down. With the high winds and heavy snows, many branches came down and on a personal level, my greenhouse collapsed from the weight of the snow and ice. Through it all though, I am thankful that we didn’t lose power, phones or heat and the storm hit the day after Christmas. One thing I try to do now is find the positive in any given situation which is why I am not complaining, even though it has started snowing again. After discussing this with my co-blogger he suggested a piece on horror movies that take place in similar situations that I am going through now. After thinking about it I realized that there are quite a few movies out there that take place during snowy, winter conditions. This list is not intended to be complete in any way…these are the films that came to mind quickly and they are listed alphabetically since, in my opinion, they stand on their own and this list is not meant to compare one to the other. 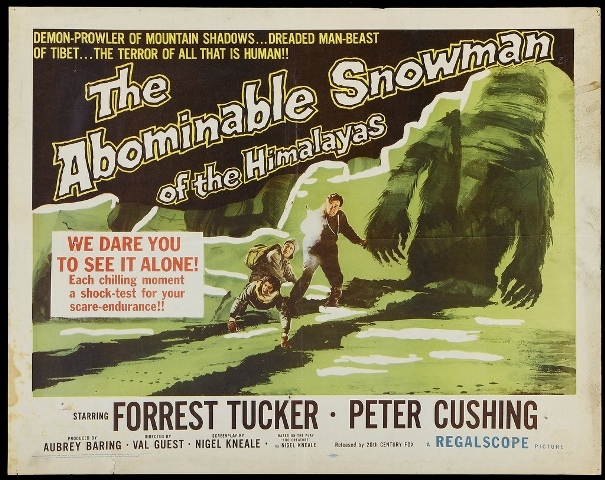 THE ABOMINABLE SNOWMAN OF THE HIMALAYAS came out in 1957 and it stars Forrest Tucker and Peter Cushing. This Hammer production concerns a botanist studying rare herbs with his wife and associate in the mountains of the Himalayas. Enter Tom Friend, on an expedition to find the Yeti, with his two associates. Friend convinces botanist John, his wife Helen and their associate Peter, to join in the search, claiming that they have seen the yeti before. Footprints are found as they get closer to where the Yeti live and a conflict is created when John has a scientific view of how the Yeti should be handled and Tom just wants to shoot it and put it on display, making money off of his find. This movie has gotten mixed reviews over the years but I still found it enjoyable. 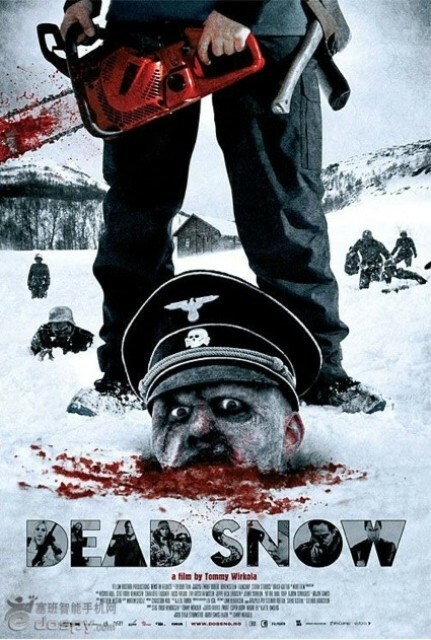 DEAD SNOW, a Norwegian film, came out in 2009. 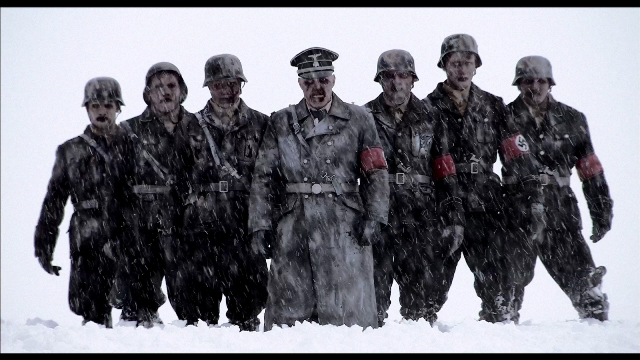 It concerns a bunch of medical students on a ski vacation who end up confronting the unimaginable…Nazi zombies! Though this may not seem like a great plot, the movie works and is a lot of fun. They advertise it as a horror comedy but to be honest, I didn’t find much humor in it (other than its tongue-in-cheek styling). Though not an Academy Award winner, I do recommend this film…the effects are good, the zombie makeups are sufficiently scary and over all the movie is very well put together, even though this movie got mixed reviews from the critics (but then again, how many zombie movies actually get good reviews from the critics?). This 2010 release, by Adam Green (best known for his movie HATCHET) is one that I could relate to. Besides drowning, one of my biggest fears is freezing to death and this movie captures that fear admirably. Three friends are stranded on a chairlift after a ski resort closes for the weekend (not to be re-opened until the following weekend). Now this may seem like an unlikely premise but it is presented realistically, making it even more believable. As they are on the lift, they must decide whether they should stay in the chair, hoping that someone comes by and sees them, or should they take drastic measures to try to get some help. 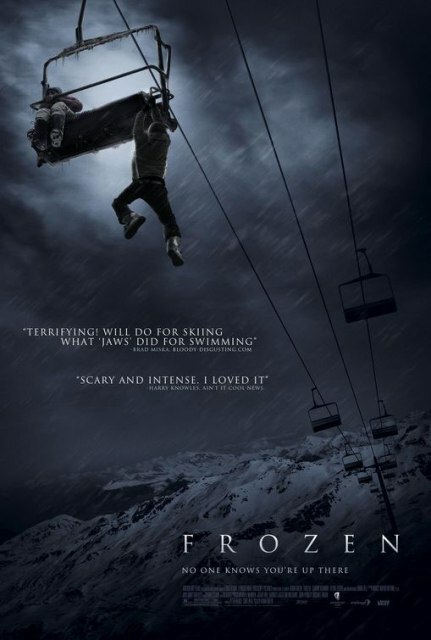 The drastic measures end up being much worse than staying on the lift and freezing to death, just adding to the intensity of this movie. 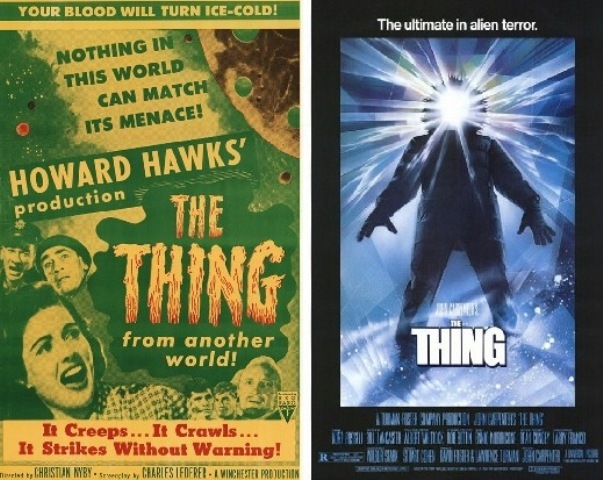 Both versions of THE THING are not only two of my all time favorite movies, but they are also two of my favorite “winter” movies. The original came out in 1951 and John Carpenter’s remake came out in 1982. Both stories are similar: they take place in the Arctic and concern the discovery of an alien life form. The original film is one of the best entries in the 1950’s alien invasion films (and was one of the first). It is beautifully shot with great sets and a likeable cast. Though it may seem dated by today’s standards you still get the feeling of isolation and how cold it really is there. The alien is far from scary (considering what we see in films now) but I bet when this movie originally came out, it got some great reactions from the crowds! John Carpenter’s remake is simply brilliant. He took the basic story of the original and was able to breathe a whole new life into it, rare in today’s remakes. Now, instead of a humanoid-alien the life form absorbs and replicates its host, often in bloody detail. Once again you get the feel of isolation and cold and the movie is tense throughout, never knowing who is human or who is an alien replicant. 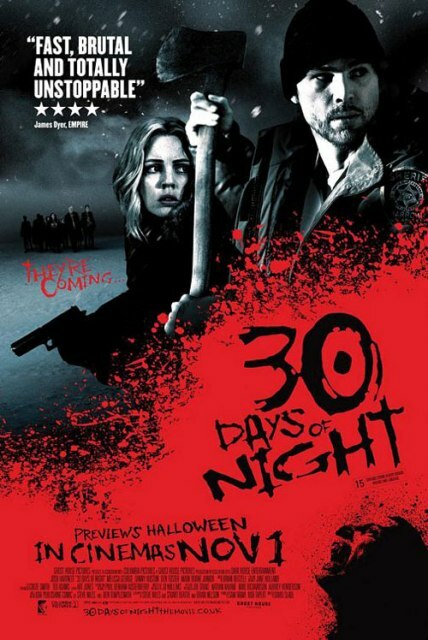 30 DAYS OF NIGHT came out in 2007 and is one of my favorite vampire movies. This story takes place in a part of Alaska, where for one month each year, it is in total darkness as the sun is below the horizon. The vampires decide to use this fact to their advantage, going on a feeding frenzy. In this film you have to deal with three things: the cold, the isolation and the vampires. I found this movie to be intense as everyone tries to brave the cold (and at times whiteout conditions with the snow) all the while trying not to get caught by the vampire horde. The vampires themselves are very scary looking and there is a lot of bloodshed. In one memorable scene an aerial shot is used looking down on the town as the vampires are killing the human and all you see is the pools of blood getting larger and larger around the victims, in perfect contrast to the white snow. This movie was a nice relief and an even nicer break from the sparkling vampires of TWILIGHT. So, if you are like me…stuck inside while winter rages outside, put on some hot chocolate, bundle up and put one of these movies on. They will definitely help you forget what is going on outside! This entry was posted in Horror, Monsters, Movie Reviews and tagged 30 Days of Night, Dead Snow, Frozen, The Abominable Snowman of the Himalayas, THE THING, The Thing from Another World, Winter Horror Films. Bookmark the permalink. ← Killer Santas & Christmas Slasher/Horror Films!